By Dave Zeitlin | Mike McLaughlin has won more than 500 games in 21 seasons as a women’s head basketball coach, so he knows a thing or two about the joys of starting a new season with a core group of veterans who have already gelled. But this year has a bittersweet edge for the Quakers’ head coach, for it will be the last time Sydney Stipanovich and Michelle Nwokedi will play together. 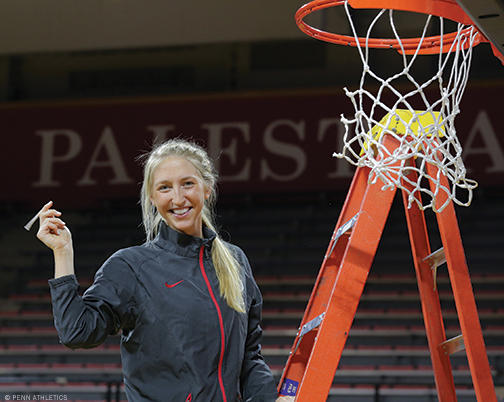 The 6-foot-3 Stipanovich returns for her senior season after winning Ivy League Player of the Year and the Ivy League Defensive Player of the Year plaudits last season. 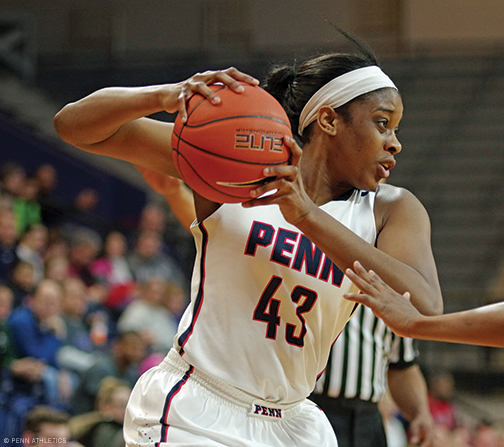 Nwokedi, a 6-foot-2 junior, was named a first team All-Ivy performer. Forming a formidable inside duo last year, Stipanovich and Nwokedi ranked 1-2 in the Ivies in rebounding and blocked shots, while combining to average 26.8 points, 19.7 rebounds, and 5.4 blocks per game. They’ll be joined by every other starter from the 2015-16 team that beat Princeton on the road in the final game of the regular season to capture the program’s second Ivy title in three years: senior point guard Kasey Chambers, junior sharpshooter Lauren Whitlach and junior guard Anna Ross. And McLaughlin expects other players, including sophomore forward Princess Aghayere, sophomore guard Ashley Russell, and junior Alexis Glasgow (who transferred from Northwestern) to provide the team with more depth than they had last season. Unsurprisingly, the Quakers head into the 2016-17 campaign, which opens against Duke on November 13, as a favorite to repeat as Ivy League champions. And they have at least a shot at emerging as a national contender. Last year’s squad went 24-5 before losing a first-round NCAA tournament game to the University of Washington, which went on to the Final Four. McLaughlin said that “managing expectations” will be important, but said the Quakers aren’t running away from them. Around the time Steve Donahue was hired to turn over a new page for Quaker men’s basketball, Matt MacDonald was looking to start a new chapter of his own. So when Penn’s new head coach called the sharpshooting swingman in 2015 to gauge his interest in joining him, the conversation turned out to be a short one. MacDonald, a transfer prospect from Fairleigh Dickinson University, needed very little convincing. MacDonald is one of two transfers and a slew of freshmen who will be vying for minutes on a roster that, at season’s start, ran 19 deep. With perhaps one or two exceptions, even returning players who saw a lot of action last season will have to fight to keep their spots. Donahue, who enters his second year in charge, insists that having so “many moving parts” is a good thing. Expectations are high for Wood, a sweet-shooting guard out of Reno, Nevada, whose father, David Wood, played for eight NBA teams between 1988 and 1997. 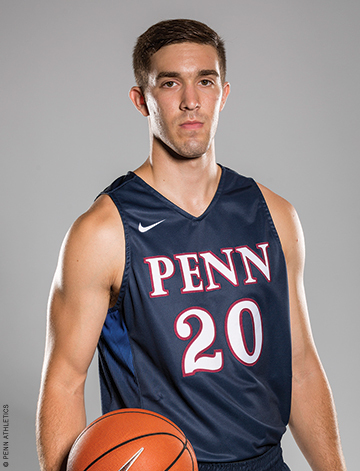 Coming from Lassen Community College in California, where he averaged 23.2 points per game and shot nearly 50 percent from three-point range, Wood didn’t know anything about Penn until recently and admitted to feeling a bit of a “culture shock” when he arrived on campus this fall. But MacDonald helped him adjust to the Ivy League, both on and off the court. The two engaged in some friendly three-point shooting competitions along with returning sharpshooters Sam Jones and Jackson Donahue, who combined to make 120 threes last season. Heading into the season, MacDonald is excited by the prospect of turning that quartet into a four-guard lineup. Transfer students have not been a typical feature of Quaker basketball, but there have been a few standouts, including Matt Maloney C’95, who nabbed three Ivy championships and went on to play in the NBA. Donahue felt it was necessary this year to bring in a couple of talented veterans to give the team a needed boost. The fact that both players are known for their three-point shooting—which the Quakers have struggled with in recent years—is an added bonus. Aside from MacDonald and Wood, several other newcomers will likely see minutes early on, particularly freshman A.J. Brodeur. The most high-profile member of Donahue’s first recruiting class, the 6-foot-8 big man from Massachusetts should help ease the loss of Darien Nelson-Henry C’16 to graduation. Donahue will have more options in the backcourt, especially with Antonio Woods scheduled to rejoin the team. Perhaps the team’s biggest offensive threat, Woods was declared ineligible last January for the remainder of the 2015-16 season and the start of the 2016-17 season due to insufficient academic progress under University policy. He had to drop out of school but is allowed to re-enroll for the 2017 spring semester and begin practicing with the team in mid-December. Donahue admitted he’s “never had to deal with” a situation like this but is hopeful that the transition will be smooth, because Woods “knows all the guys” and appears to have learned from a rough experience. If he returns in good form, he and senior guard Matt Howard could form an explosive partnership. Of course, when the season opens at Robert Morris on November 11, it’s anyone’s guess which players will rise to the occasion.